Honduran Milk Snake, Lampropeltis triangulum hondurensis. I named him Snakey Snake! This is the guy who sucked me back into keeping snakes a decade ago. I walked into the East Bay Vivarium looking for a Sinaloan Milk Snake and walked out with a Honduran Milk instead. I just liked him. Big, beautiful and active. He burrows most of the year in his substrate. But every spring he first goes on a hunger strike and than he wanders around his vivarium looking for the ladies. I've never had a lady for him though. Poor guy. In the second photo, that is Snakey Snake hunting! As a hatchling and a youngster he would eat whenever I fed him. At 4-5 years of age he started to eat on his schedule, not mine. So now I wait until he displays hunger behavior to feed him. He shows me he is ready to eat by burrowing completely into his substrate and sticking just the end of his nose out. You would never know that tiny head had a 5 foot body attached to it! The bedding is an unscented, chemical and dye free paper animal bedding. Its easy to clean and he loves to burrow in it. Burmese Star Tortoise, Geochelone platynota. I really wanted to get a tortoise for a long time. After a bunch of research, and lots of wandering around the internet and Youtube, I settled on the Burmese Star as a species I wanted to work with. They are a dry grassland species, which works well with the area I live in. They don't get particularly large, eat grasses and weeds that are easy to come by, and their overall care is not particularly intense. More importantly, they are species that is need of captive breeding. Functionally extinct in the wild because of the Chinese food and traditional medicine trade combined with Myanmar having a dysfunctional government, Burmese Stars are in need of captive breeding to prevent total extinction. Burmese Stars have not been imported as pets into the US in decades, so what animals we have in the US are all we have. The good news is the species is being bred very successfully by both professional zoos and captive breeders alike. The more common they become the more likely the species will survive. They are a species I feel is worth the time and effort to breed and care for. I picked up a temperature sexed male and female pair with unrelated parents from Chris Leon of Garden State Reptiles. So far they have been highly entertaining, incredibly interesting little guys. Talk about a long term breeding project: it will be 5-7 years before I can even attempt breeding them. Super Dwarf Retics, Reticulated python. I love retics but I just don't have room for a 15-19 foot snake. 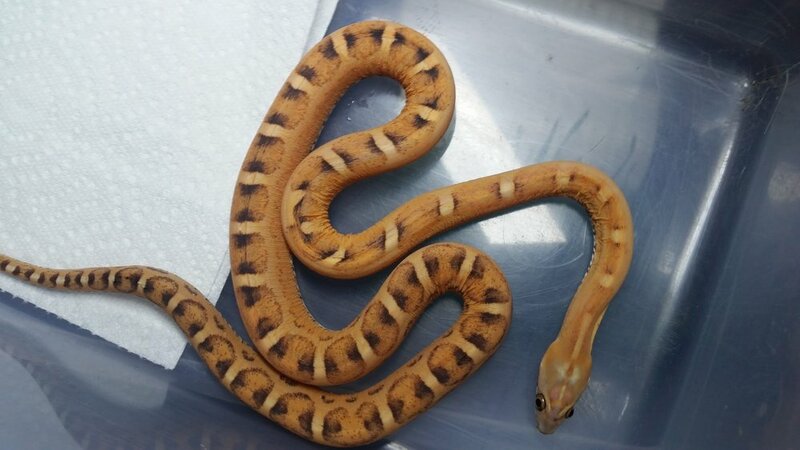 So I picked up a pure super dwarf kalatoa retic in 2014 from Travis Kubes. She is awesome but feisty. She may not ever be a giant snake but she is still a serious girl. At two and a half years old she is 1300 grams with a body much more like a bull snake or a rat snake than a python. Long and slender rather than short and chunky. She is immensely strong, really quick, and really smart compared to a ball python and her feeding response is impressive. Behaviorally, she is very aware of her surroundings. I keep her in a 36" x 24" by 18" Boaphile at chest height, and she is always watching when I come into the snake room. She will even move to the front of the cage to keep watching me as I move around. I love her activity level, she is easily the most interesting snake I have from a behavior perspective. I also have just picked up a hatchling male pure Kalatoa. I've only had him since early in February, 2017 so I just don't know him well yet. He is tiny- 52 grams and about as thick around as Sharpy marker. He is really dark with cool rosettas down his sides. Hatchling Male SD Kalatoa, January 2017 baby. I have a single corn snake, a scaleless girl. She is feisty and when she wants to eat her feeding response is on par with my retics! Good thing her mouth is so tiny. She is the first corn snake I have ever had. I just liked how the scaleless pattern looked. For those of you with no experience with a scaleless corn, they actually have belly scales and they still shed. When she sheds what comes off is a silky tube. Is she at a disadvantage not having scales? In my opinion she isn't. She is a happy, well fed, pet snake. Not a wild snake. She eats fresh kill or frozen thawed mice and is in no danger from mouse teeth. She eats very aggressively, and would eat much more than is healthy for her if I let her. You can see a shed and her belly scales in the second photo.